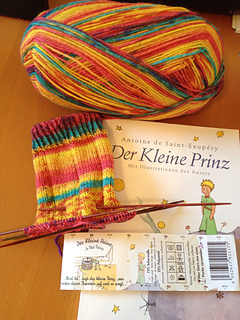 Aravis83 sent me a copy of “The Little Prince” in German, and a ball of matching sock yarn! 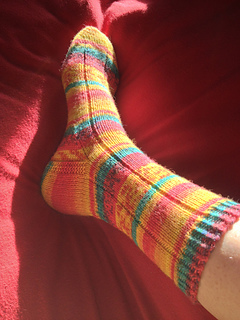 The yarn is called “Der Kleine Prinz und der Brunnen” (The Little Prince and the well) and it’s a delicious mix of yellow, orange, pink, purple, and aqua. 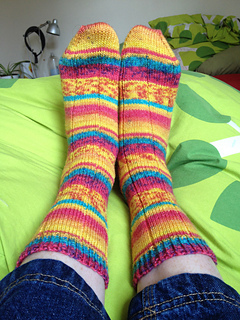 I don’t usually knit with multicolored yarn but now I see why people like it -- it is such fun to watch the colors changing as I knit! 60 rounds, then heel on 30 st for 17 ridges. 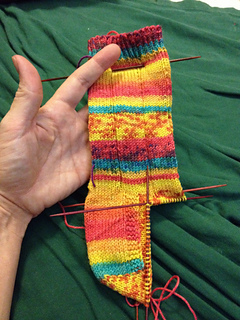 Decrease gusset every other round. 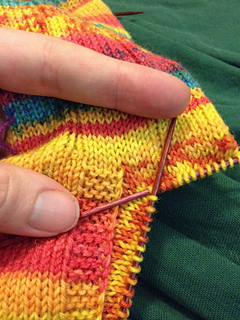 Here’s a great trick to avoid a hole at the corner of the gusset! 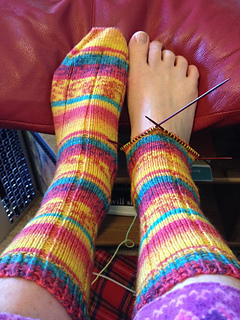 This yarn is REALLY nice to work with and it feels great!